Mold! A long standing enemy of any wet, enclosed environment. One of the easiest places to find mold’s favorite conditions is, unfortunately, your bathroom. What does mold require in order to thrive? 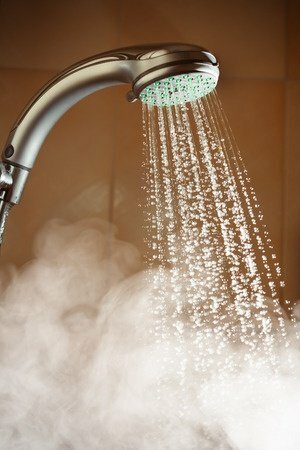 Plenty of moisture (a condition that will occur around the water in your bathroom), a food source (unfortunately, mold enjoys snacking on soap residue), and warmth (a cold bathroom? No thanks!). So unless you enjoy cold, dry bathrooms devoid of soap, mold must be fought through smart design and materials that can keep the human occupants comfortable while making survival tough on mold. Fortunately, we have raced a few steps ahead of this unwelcome guest. For bathrooms yet to be built, contractors can install impermeable waterproofing materials, like Schluter Systems’ Ditra Shower System, that can prevent water leaks to keep moisture from reaching unprepared surfaces. Remember that mold needs moisture to grow, so if water can’t reach in, neither can mold. Another method of keeping moisture away is to ensure proper ventilation. Adequate ventilation pulls moisture out of the confined space of the bathroom to ensure that wet surfaces dry quickly. But what about existing bathrooms that don’t have the benefit of new materials or techniques? The same ideas apply to existing bathrooms, but need a bit more hands-on help. Ventilation is still very useful in the pre-existing bathroom. Run the bathroom ventilation fan during your bath or shower. Before leaving the shower, quickly dry off the tile surfaces (this will also reduce the amount of soap residue, reducing the amount of readily available food for mold). Leave the fan running for up to half an hour after the shower, and make sure to clean all the exposed tile at least once a week. If you have any questions about the best way to keep your tile looking its best, contact us or visit one of our showrooms. We are always happy to help!